A friend of mine was at a party on Sunday evening of May 25th. She met a woman in her 80’s who was enjoying the party and they fell into conversation. My friend learned that this woman and her husband spent the previous night on the roof of their house waiting to be rescued from the rapidly rising waters of the Blanco River. Not the sort of activity one expects from a couple in their 80’s. This news astonished my friend and she further wondered how the woman and her husband managed to climb up onto the roof of their house. The woman said that was rather easy as they just hung onto things until the rising water lifted them to the roof. Then, they simply waited for rescue. The recent floods along the Blanco River in Hays County, Texas produced many stories of horror, tragedy, bravery, survival, and resilience. Many of the people affected were elderly and saw homes they had lived in for 30, 40 years flooded or washed away. This one story, touched on a most admirable quality. This elderly couple found themselves in a difficult and dangerous situation where they stayed calm, literally rode with the tide, and were able to enjoy a party that evening. This is the 200th article written for the Weekly Update on Aging. There have been many guest bloggers and I’ve written a few myself. The ETGEC grant is ending on June 30, 2015. This blog will continue, but may become less frequent and the Weekly Discussion on Aging will not be held in the future. 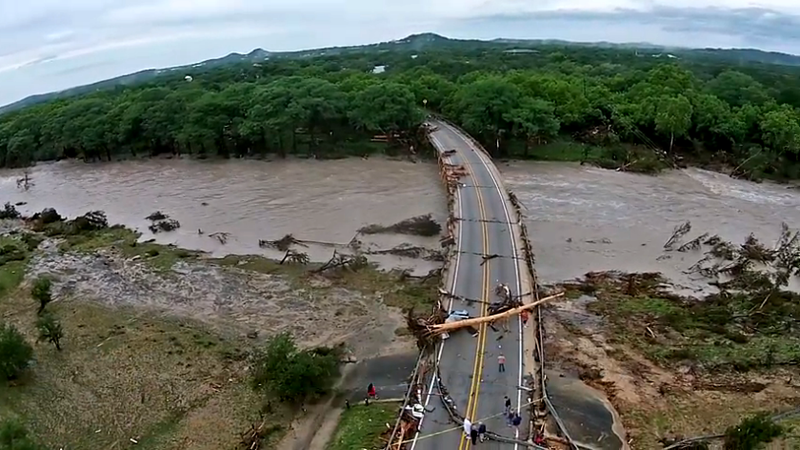 Image from video taken by Stephen Ramirez, Birds Eye Video, and shown on the San Marcos Corridor News website. The picture shows RR12 as it crosses the Blanco River and looking towards the square in Wimberley.